We repair or service almost all makes and models of electronic organs, digital pianos and keyboards as well as other electronic musical equipment such as Leslies, guitar amplifiers, mixers, power amplifiers, effects pedals, and such. See below for our "authorized servicer" list. While centrally located in DeLand (Western Volusia County, Florida), we regularly service a radius of about 100 miles. We visit Lake, Orange, Seminole, Marion and Flagler Counties weekly and service Volusia County two days a week. In most of these areas local service call rates apply. Others areas such as Sumter, Putnam and St. Johns counties are within easy reach. Give us a phone call to setup "on location" service and get a rate quote or visit the 'contact us' page to email us. 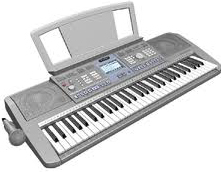 We have several convenient locations for drop-off of electronic instruments like keyboards, guitar amplifiers, mixers and other portable stuff. Please click here for Carry-In/Drop-Off locations or contact us for the drop-off location nearest you. Roland US Yamaha Corp US Lowrey Organ Co. Even though some of these companies are not around anymore, their equipment is still, normally, very repairable. In many instances it is easier to find parts for older equipment than for the newer! This is because older instruments quite often used more 'generic' parts than their more modern counterparts. So, before you give up on getting that older instrument repaired, please give us a call, you might be pleasantly surprised!